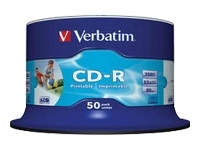 CD-R is short for "CD-Recordable". The discs are also known as WORM media which stands for Write Once, Read Multiple. The advantage of CD-R over other types of optical media is that you can use the discs with a standard CD player. The mechanical specifications of Verbatim media are very precise, and data written to it can be read in a wide range of drives. As a result, Verbatim DataLifePlus discs demonstrate a high level of compatibility between drives running at a wide range of speeds.